After creating a project in Adobe Photoshop Elements, you have a number of output options. You can write a project to disc for archival purposes and include slide shows on a video CD (videodisc) or DVD. You can e-mail a slide show to another user, share a project online, write a project compatible for display on a TV, or save to either a PDF slide show or Windows movie file. In the Organizer, double-click the project thumbnail. The project opens in the Adobe Photoshop Elements Slide Show Editor. Click the Output button on the Shortcuts bar. The Slide Show Output Wizard opens. This figure shows the wizard as it appears in Windows. 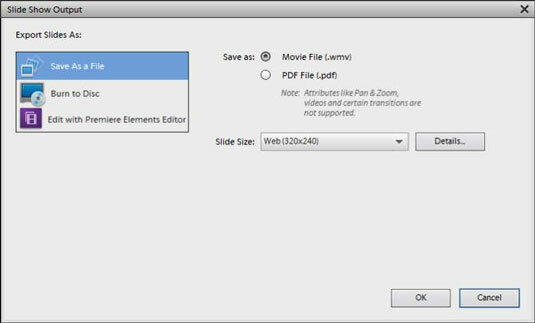 Movie File (.wmv): Select this option to export a Windows media video file. Your exported video can be viewed in Elements or in the Windows Media Player. You can import the video in all programs that support .wmv files. To find out how to convert video for viewing on iPhone and iPad and viewing PDF documents on these devices, you need more information than covered here. There’s quite a bit to understand regarding video formats. In the dialog box that opens, prompting you to add your output file to the Organizer, click Yes. You can now easily view the file by double-clicking it in the Organizer. If you use an iPhone, iPod, or iPad, and have Adobe Premiere Elements installed, you can choose the last option in the Slide Show Output Wizard: Edit with Premiere Elements Editor. In Premiere Elements, you can export directly to iPod/iPhone format, which is readable on all your iOS devices as well as Mac computers.